Following the death of Caracalla in 217 AD, the double aureus did not immediately survive. The double aureus was finally reintroduced around 249 AD by Trajan Decius (249 – 251 AD). The silver antoninianus did manage to hang on briefly, but it was not issued in substantial quantities. It completely disappeared from the regular issue of coinage by 220 AD and reemerged again around 239 AD when it eventually superceded the denarius altogether as the main currency denomination. p>The death of Caracalla marked the struggle for power between 217 – 218 AD, which would ultimately set the tone for the collapse of both the monetary system as well as the political system of Rome. Caracalla had been murdered by the Prefect of the Praetorian Guard, Macrinus (217 – 218 AD). Caracalla’s great aunt, Julia Maesa, was a dominant woman who launched a successful revolt in favor of her grandson, Elagabalus (218 – 222 AD), which restored the Severan Dynasty for a brief period. Under Elagabalus, the process of debasement continued with the silver fineness of the coinage dropping to a mere 45% during the Civil War. By 220 AD, the silver fineness rose ever so slightly to a mere 46.25%. With the murder of Elagabalus by the Praetorian Guards, his acknowledged heir and cousin, Severus Alexander, was raised to the throne in 222 AD. Again, we find that the silver content of the coinage was immediately reduced to 42.75%. In 225 AD, the silver content was reduced slightly to 42%, but by 228 AD we see a marked increase back to 47% followed by a rise to 49% in 231 AD. However, the unpopularity of Severus with the army, due to the dominance of his mother’s interfering with the state, led to his murder and another political crisis. The rebellious troops hailed their commander as Emperor Maximinus I, who in turn was murdered by his own troops upon his attempt to march on Rome in 238 AD. The political chaos unleashed in 238 AD saw a succession of no less than four emperors during a single year. The victor was the young Gordian III who was proclaimed emperor by his troops out of honor for his grandfather and uncle, Gordian I and II respectively. While the reign of Gordian III (238 – 244 AD) was merely 8 years, it was a period of comparative stability making him one of the longest reigning rulers of the mid 3rd century AD. Nonetheless, Gordian III was murdered by his Prefect of the Praetorian Guard, Philip I (the Arab). It was during the reign of Philip I (244 – 249 AD) when the denarius nearly disappeared being virtually replaced by the double denarius (“antoninianus”). The year 248 AD brought with it more political chaos as several usurpers appeared all at once. Eventually, Philip I was defeated by Trajan Decius in 249 AD and it is at this time that we find a major attempt at monetary reform once again. While Trajan Decius’ reign was less than 3 years, we find a major attempt at reforming the bronze coinage, which had also suffered from a steady reduction in weight over the years. Thesesterius had declined from the reign of Nero (54 – 68 AD) of 27 grams down to 24 grams by the reign of Hadrian (117 – 138 AD) and even further to 17 grams by Philip I (244 – 249 AD). Trajan Decius introduced a double sesterius with a weight of 29-30 grams distinguished once again by a radiate crown. We also find an attempt to reintroduce a bronze semis equivalent to a half-as, which did not survive his reign. Trajan Decius also introduced a commemorative issue of silver antoninianii with the defied busts of Augustus, Vespasian, Titus, Nerva, Trajan, Hadrian, Antoninianus Pius, Marcus Aurelius, Commodus, Septimus Severus and Severus Alexander. This coinage issue was a clear attempt at reminding the Roman public of their history and Trajan Decius’ effort to restore the glory of Rome. Trajan Decius fell in battle against the barbarian invasions of the Goths during 251 AD. Trebonianus Gallus, one of his generals, succeeded Trajan, but did not continue his monetary reform. The double sesterius andsemis both disappeared from the regular coinage of Rome. Gallus was not popular and by 252 AD was challenged by the usurper Aemilian (252 – 253 AD) who successfully emerged as emperor. However, after a reign of only 88 days, Aemilian was murdered by his own troops when faced by the legions marching upon Rome under the command of Valerian I (253 – 260 AD). With the rise to power of Valerian I in 253 AD, the empire was at last stabilized for the most part until about 259 AD when Gaul broke away from Rome under the leadership of Postumus (259 – 266 AD). The Roman economy came under severe regional economic pressures, which lead to the temporary breakup of the super state between 259 – 260 AD. With the successful separatist movement in Gaul, a similar attempt was made in the East when Macrianus was proclaimed Emperor by his troops. Another usurper appeared in Panonmia also in 260 AD named Regalianus. His coinage is very interesting. Not merely do we find the workmanship to be quite poor, but we also see evidence of the economic chaos of the period as well. Regalianus simply lacked the proper resources to coin new money. Consequently, Regalianus merely struck his own image over that of previous emperors on coinage currently in circulation at that time. What is most interesting is that we find his issues struck on a variety of coins without regard to metal content. Therefore, the antonianianii of this emperor are found to be over struck upon previous debased antoninianii as well as good silver denarii. This may imply that as the coinage began to decline rapidly in silver content, the old silver denarii in circulation may have rose in value equal to that of the antoninianius. It is certainly difficult to determine exactly what took place during this period. However, human nature never changes. It would be safe to assume that coinage of good metal was most likely hoarded in according with Gresham’s Law during this period as well and thus there must have been an implied premium attached. Exactly how much of a premium was perhaps also determined on a black market type of basis, which would have naturally fluctuated with time and location. This political disintegration came largely during the reign of Gallienus who was the son of Valerian I. Eventually, much of the Eastern provinces were lost to Palmyra and Postumus not merely took Gaul, but also Britain and Spain. The monetary system of this brief period demonstrates clearly the economic chaos that prevailed. The silver content of the double antoninianus plunged to the point that the coin had been reduced to a mere token bronze coinage that had been chemically plated with silver in a vain ttempt to maintain a silver appearance. This is quite similar to the collapse of the silver standard in modern times when silver disappeared from the entire world coinage between 1965 and 1968. In many cases, the silver coinage was replaced with nickel or in the case of the US, a clad coin with a copper center. 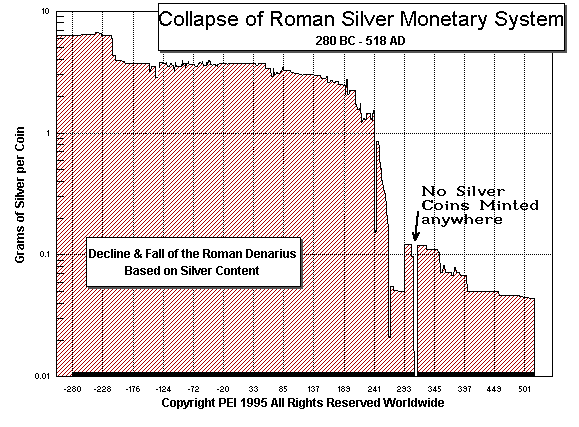 Within a rough time span of 3 to 4 years, silver disappeared from the coinage of Rome as was the case in modern times. The coinage under Gallienus is by far one of the most prolific of the entire period. It is also one of the crudest in workmanship. Both traits reflect the sorry state of economic and political affairs within the collapsing Roman Empire. Even the gold coinage suffered to such an extent that there appears to be almost no standard of weight. The range of the aureus appears to be 3.69 to 1.85 grams. The double aureus of this period is barely 60% of the weight for the aureus of Augustus – a mere 5.3 grams. As is the case throughout history, economic instability promotes political instability. The massive collapse of the economy and hyperinflation no doubt contributed to the decline in political support for Gallienus who was assassinated by his own generals Claudius II and Aurelian in 268 AD. Following allienus, Clauius II became Emperor. His reputation would survive for nearly a century as the “restorer” of the Empire. He was given the title of “Gothicus” for his magnificent defeat of the Goths. Nonetheless, the monetary system was not high on his list of reforms. Consequently, the coinage that remained was comprised of gold and the bronze “silvered-washed” antoninianus. The workmanship is still quite crude again illustrating the haste with which currency was being minted. There does appear to be perhaps a double antoninianus or effectively a quadruple denarius, which was being issued during the early 3rd century. These unusual coinage issues are only distinguishable by weight and not by design. The first appearance of a possible double antoninianus took place during the reign of Philip I (244 – 249 AD) and certainly exist into the early reign of Gallienus with issues known to exist even for his son, Valerian II while Caesar (253 – 255 AD). The last double antoninianus, which can be at least reasonably identified, ends with the reign of Quintillus, the brother of Clauius II in 270 AD. Pingback: Hongkong Y-ou International Trade Co., Ltd.
Pingback: sports arbitrage and surebet odds.